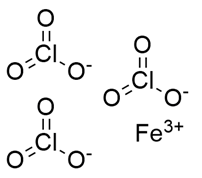 The other name for ferric chloride is iron chloride and it could be defined as the inorganic salt that is further used as a catalyst in chemical industries. It is further used for the treatment of wastes as well. The chemical structure for the compound is written as FeCl3 with a molecular weight of 162.2 g mol-1 approx. It can be found in nature and prepared in industries as well. The anhydrous ferric chloride has an octahedral geometry and its chemical structure could be given as below. The compound is available rarely as a free state in nature and it is available in minerals too and present in areas of volcanic activities. The chemical reaction for the compound is given as below. Additionally, there are other methods too for preparing the ferric chloride but it is taken as the simplest technique and suitable for everyone. The color of the compound is given as orange o brown based on the concentration level. In a few cases, the crystals of ferric chloride could result in green color too. The melting point of the compound is 304 ºC and its density is 2.8 g mL-1. It is soluble in water and reacts exothermally and sometimes quite corrosive too. Further, it is soluble in organic solvents too. The compound has the weak Lewis structure and it can be used as the catalyst in the organic synthesis process. The ferric cation is very small in size and highly charged. It can be rapidly dissolved in water to form hexahydrate complex.